Today’s podcast is actually NOT about American flowers, but about our gifted and inspiring kindred spirits across the Atlantic. 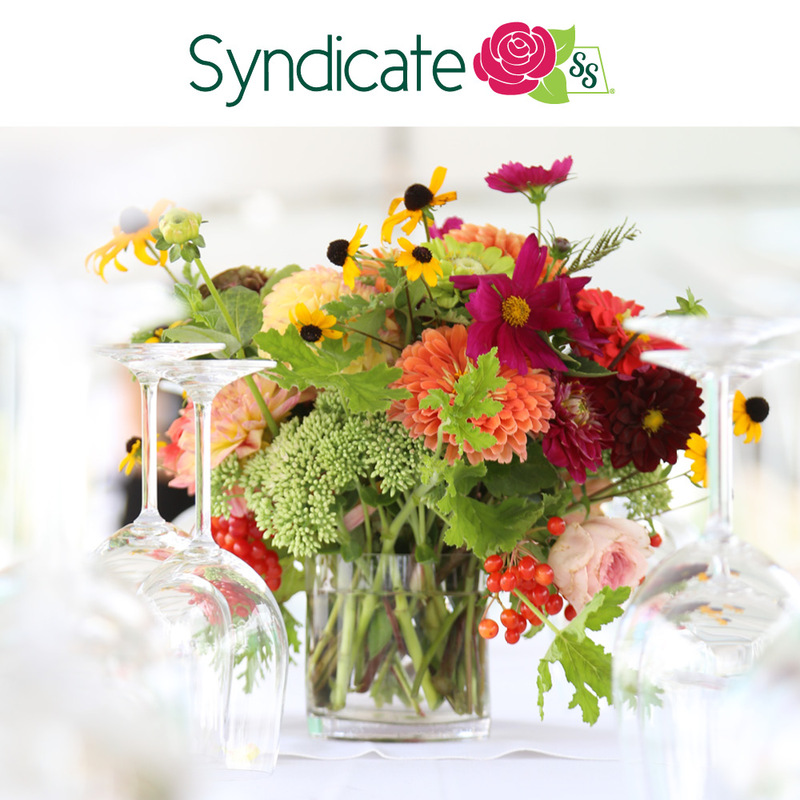 They are a few of the many flower farmers and designers who are part of their own local flower movement in Britain. 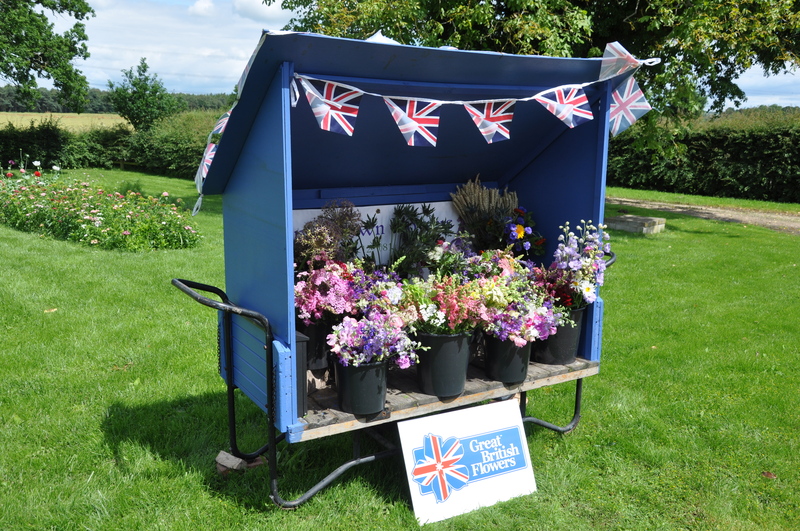 During the past several months, I often noticed the hashtag #britishflowers pop upon Twitter. It was fun to read comments and re-tweets and click through to view beautiful photos of British designers, farmers, gardens and flowers. One of the Twitter names that I started interacting with was Cook & Carlsson, and I soon learned that Lizzie Cook and Moa Carlsson are the two women behind that venture. With the alluring tagline: “English Grown Flowers,” Cook & Carlsson is a London-based design studio combining the talents of Lizzie Cook, a photographer and artist, and Moa Carlsson, an architect who has worked most recently worked in landscape architecture. 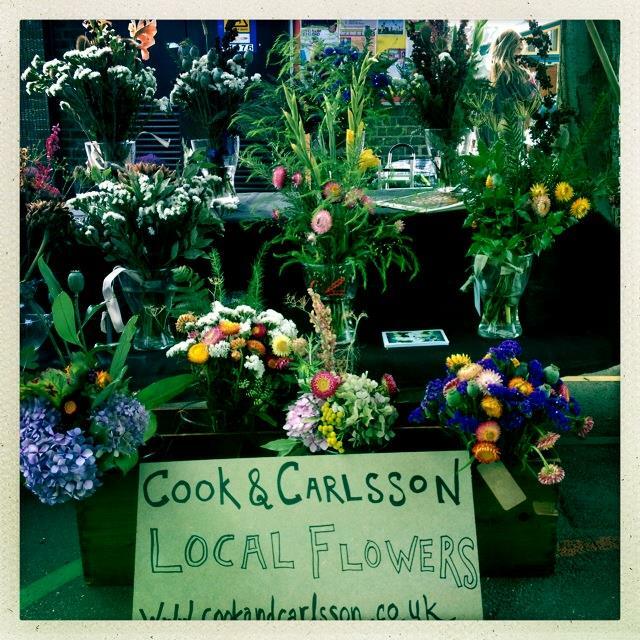 They describe Cook & Carlsson as an “independent flower monger,” and you’ll hear in our conversation the charming explanation for their use of that term. 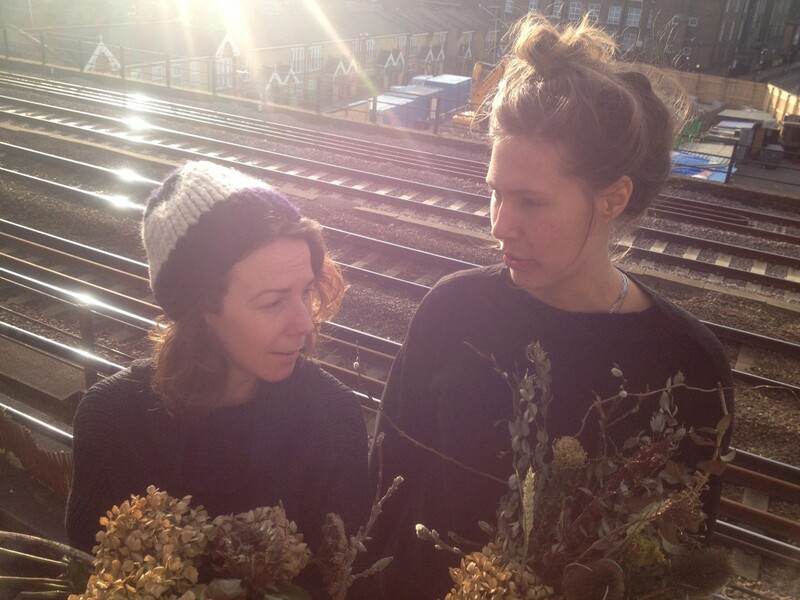 Lizzie, who has the British accent, and Moa, whose accent reveals her Swedish heritage, have joined their mutual love of nature with a desire to create beauty using flowers they grow or forage, as well as flowers they source from other UK flower farmers. 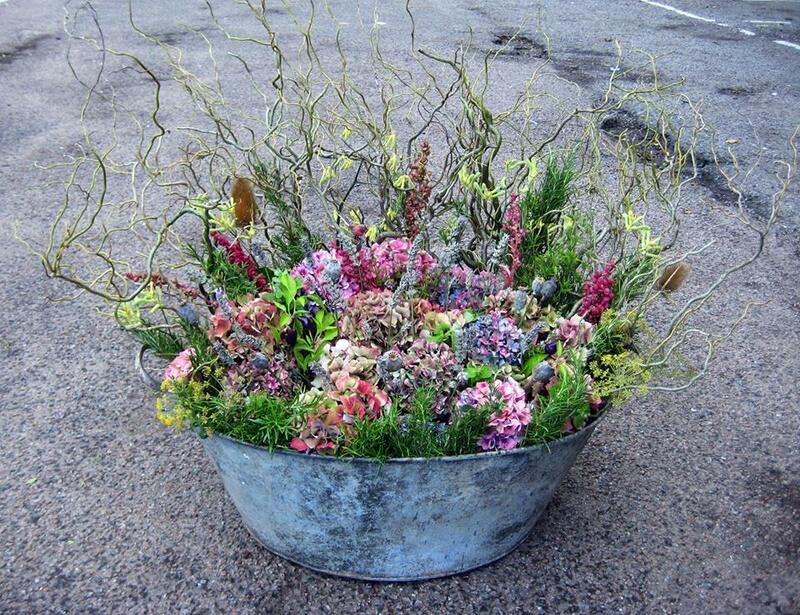 For an art commission, Cook & Carlsson supplied a large arrangement made entirely of scented herbs, wildflowers and flower – all local, seasonal and sustainable, of course! I grew up in the most northern part of Sweden, amongst aconitum, arctic bramble and Norwegian spruce, and in a family with a long tradition of growing food and flowers. My sister and both my mother and my grandparents kept large grounds living in tune with the seasons, which in their part of Sweden is rather harsh. (for example, you can’t grow apples there). I studied and worked as an architect in Sweden, Austria, England and America. Right now I live in London, but I am a PhD student at MIT in Boston, where I am studying computational technologies to design and simulate the changing of landscapes. In my free time I dig in my friends gardens and in the urban plots where we do guerilla gardening; I do hiking and mountaineering; I am a painter and I have a hunting license (mostly forest/mountain birds and hare). 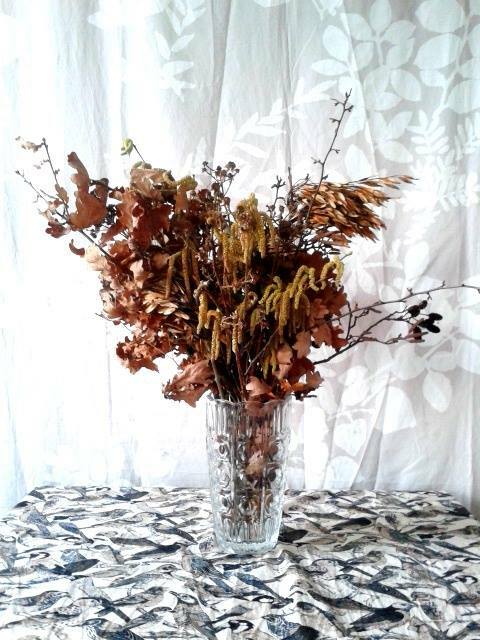 A seasonally-inspired autumn bouquet – nature’s gifts in a vase. I grew up in the Caribbean amongst the audacious vibrancy of hibiscus, frangipanis and flowers from the Flamboyant tree, all of which fired my senses as a child. The fragrance and colours of the frangipani flower at the right time of day is pretty intoxicating! When I went to Falmouth College of Arts in Cornwall to study photography, I fell in love with all of the tropical gardens, which reminded me of the flora and fauna of warmer climes. I had a very free childhood, outside, rarely wearing shoes and in nature, noticing the changing seasons, being free to take it all in. I love being near the water and I currently live on a narrowboat on a river in East London, still trying to hold onto that freedom and proximity to nature, especially in the City of London. I like seeking out the quieter natural areas, but enjoy the diversity and pace of London. It is a privileged thing to cycle home from the hectic city back to a peaceful boat on a river surrounded by nature reserves, and I feel very lucky! Cook & Carlsson’s stall at the Chatsworth Road Market in East London. We live really close to one another, just on the outskirts of London, which means there are lots of small natural refuges where you can feel like you are still connected with the wider countryside. It was in these places where our imaginations were fired and it’s really where we had the idea of using flowers and foliages that we saw around us, but which had been forgotten about or blocked out by the increasing urbanization. We began looking and learning about the species that were around us and rediscovering their simple beauty; we began mixing them with other things, falling in love with the results. 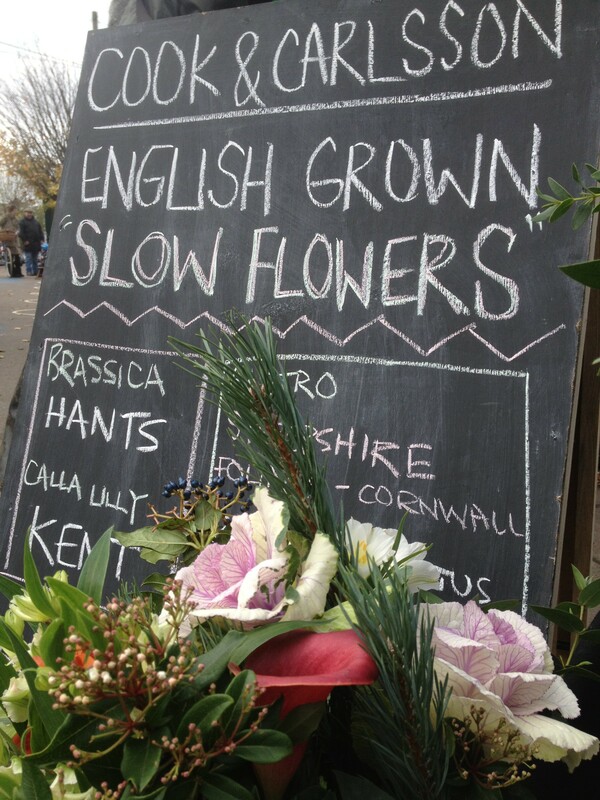 Doing so and by growing our own flowers, we try to bring back varieties that London shoppers rarely get a chance to buy. For us, it’s about the lifestyle that comes along with the business. We are very lucky to visit lots of local gardens, growing sites, nurseries, meeting local growers and hanging out with people who are on the same page as far as our ethos is concerned. Then we collect all of our material and put it together, which we relish as it appeals to our strong creative sides, the combination of which seems to be magic! Many laughs and good biscuits make good arrangements, we have found. Through our exchanges, I learned that Cook & Carlsson is the first London-based member of the “Flowers from the Farm” organization, which was founded by Gillian Hodgson. Lizzie and Moa were sweet enough to connect Gill and me. 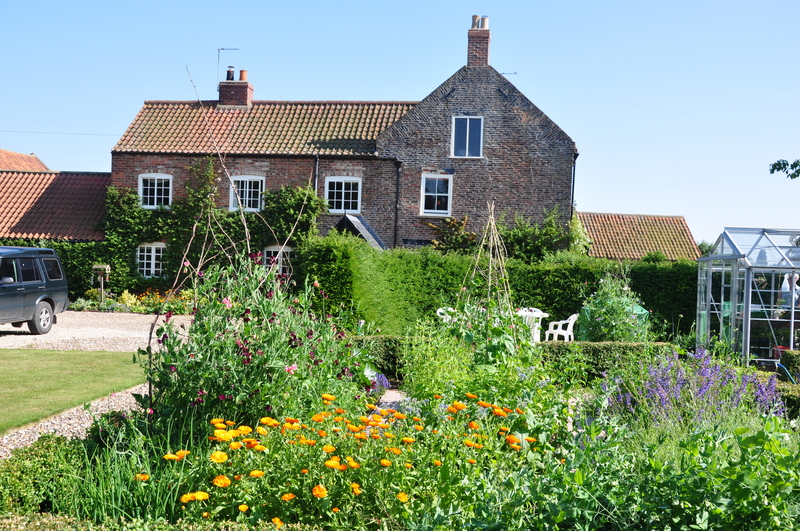 Field House Farm in Yorkshire, where Gillian Hodgson grows her beautiful British flowers. 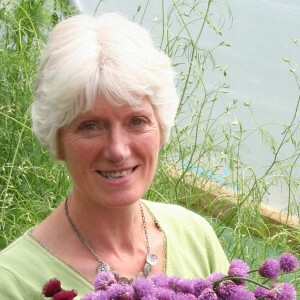 Gillian Hodgson of Fieldhouse Flowers and Flowers from the Farm, the #britishflowers organization. As you will hear in our interview, Gill has been putting much of her energy into promoting British flowers through Flowers from the Farm. 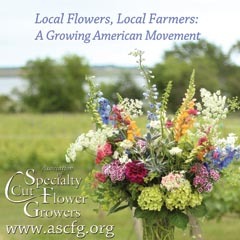 She and others came together in 2011 to launch this network of cut flower growers. Read more about the group’s origins here. 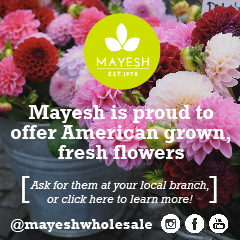 “Our aim is to create a brand for British flowers as a World class product,” reads the organization’s web site. And the tag-line: “Putting British flowers back into every vase in the country,” sounds comfortably familiar with the way I conclude each of my podcasts. I invite you to join all three of them on a Twitter chat any Monday. The #Britishflowers chat takes place at Noon Pacific/3 p.m. Eastern every Monday (and that means 8 p.m. GMT/Greenwich Mean Time). Please look for these inspiring leaders of the #britishgrown flower movement on Twitter and more. 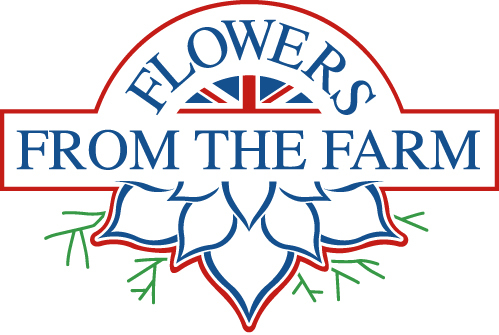 To follow up on Gill’s story about the “fake” British Valentine’s bouquet and how the UK flower farmers used social media, especially Twitter, to highlight the inaccuracies, follow this link to Flowers from the Farm’s media report. 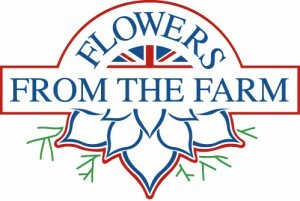 Farm gate sales of British flowers. 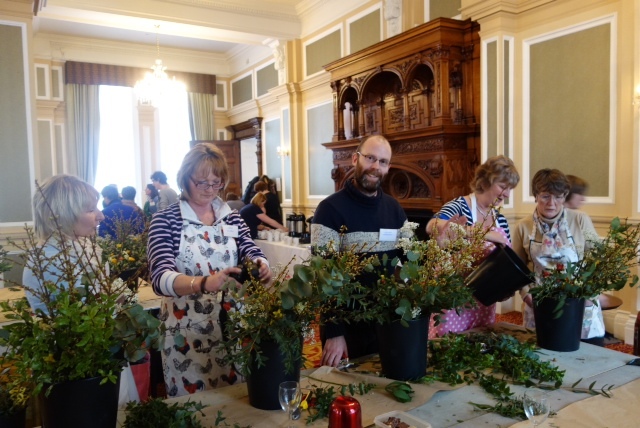 A hands-on Flowers From the Farm workshop for new and established UK flower farmers, which took place in Harrogate. 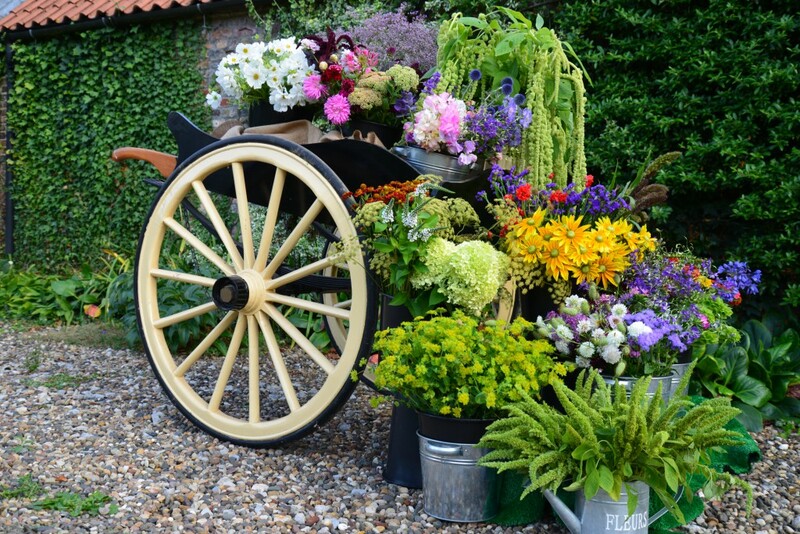 At the height of summer, Gill Hodgson’s flower farm explodes with a beautiful array of blooms. 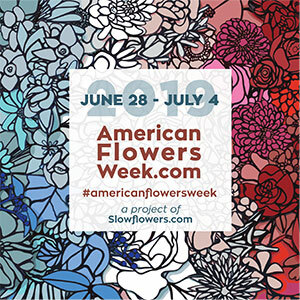 So many connections to make as together we promote our domestic cut flower farming industry and the floral designers who care about the origins of their design work. Special thanks to Lizzie and Moa for permission to use the photographs they provided; and to Gill for permission to photos of her farm and the Flowers from the Farm participants. My friend Kasey Cronquist started the hash-tag #originmatters. In the UK, Gill Hodgson calls the same idea #knownprovenance. 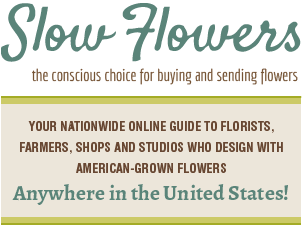 Similar in their intent, both phrases highlight what is going on in both the U.S. and the U.K. Consumers want to know the sources of their flowers. And flower farmers are fully engaged in providing that information! It has been my pleasure to share with you today’s podcast conversations. Apologies for the uneven audio quality in some places, which was subject to the idiosyncracies of doing interviews via Skype. In the second interview, my voice was quite garbled, while Gillian Hodgson’s came through very clear. So we had to re-record many of my questions and patch together the interview. I’m sure you’ll really enjoy these interviews, despite the minor tech problems. Because of the support from you and others, listeners have downloaded episodes of the Slow Flowers Podcast more than 6,500 times! 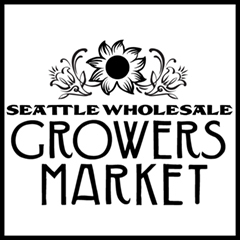 I thank you for taking the time to join to my conversations with flower farmers, florists and other notable floral experts. 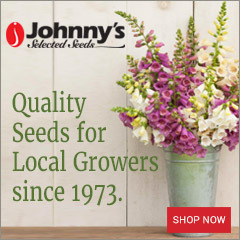 This entry was posted on Tuesday, February 18th, 2014 at 11:39 pm	and is filed under Creativity, floral design, Gardening, General, Plants, Podcast Episodes, SLOW FLOWERS Podcast, Writing. You can follow any responses to this entry through the RSS 2.0 feed. You can leave a response, or trackback from your own site.